Another fine pedal from the KHDK team. Scuzz setting is impressive. Great voicing. 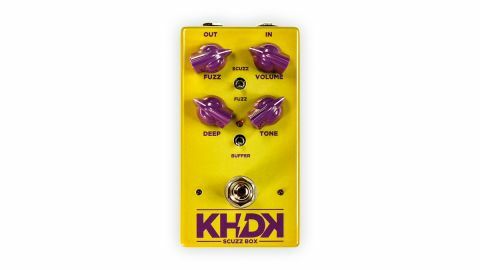 From Kirk Hammett's KHDK stable, the Scuzz Box offers two very different modes (Fuzz and Scuzz). Fuzz is much like any germanium fuzz (think Hendrix-era Fuzz Face), giving great dynamic tones that clean up nicely with your guitar's volume, while the tone and deep knobs act more as high- and low-cuts respectively. Where it really comes into its own however, is on the Scuzz setting. This gives you a gated velcro fuzz tone with hint of octave/bit-crushed effects, but never becomes thin and grating in the top-end like some more extreme fuzzes can. There's also a buffer switch that's really handy for reducing interference when used in conjunction with other pedals or long cables.